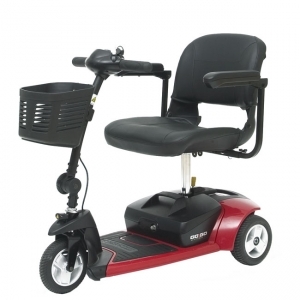 The Go-Go® Ultra X is loaded with design features like an innovative locking mechanism that allows one-handed frame disassembly and a convenient drop-in battery box that makes transport and travel worry free. The Go-Go Ultra X delivers these features and more along with the performance you expect from the first name in travel mobility from Pride Mobility, making it the ultimate travel scooter value. The Go-Go Ultra X scooter is a lightweight ride suitable for travel on well-groomed paths and paved surfaces. Easy to break down into lightweight sections, this model is a breeze to transport and store. Equipped with convenient feature such as a basket and flat-free tires, the Go-Go Ultra X makes it easy to travel without the worries of a flat tire. Reliable and functional, the Ultra X boasts a stable design, it turns on a dime and it’s an affordable mode of travel suited to indoors and out. The 3-wheeled Pide Go-Go Ultra X features easy one-handed breakdown into five separate components that weigh 28 pounds or less. Capable of speeds up to 4 MPH and a running time of up to 8 miles on one charge, this scooter also features on and off-board charging. The weight capacity for the Ultra X is 260 lbs. Weight capacity is 260 lbs.